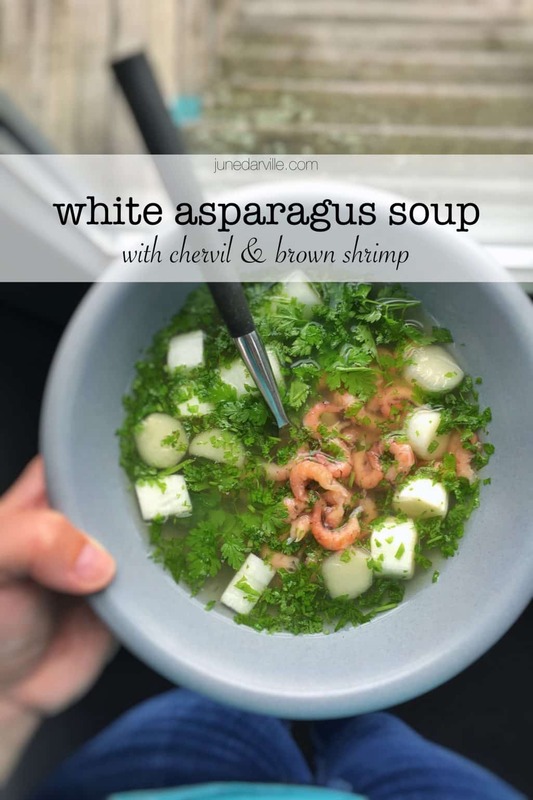 Belgian Chervil & White Asparagus Soup Recipe | Simple. Tasty. Good. 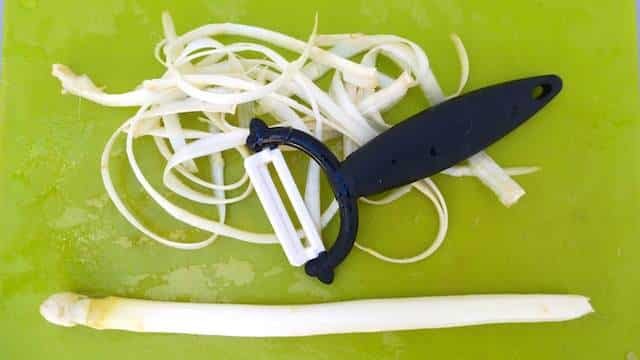 Look, this white asparagus soup recipe is actually a kind of ’leftover’ one. We are only going to use the asparagus skins you peeled and the bottom bits of the asparagus. 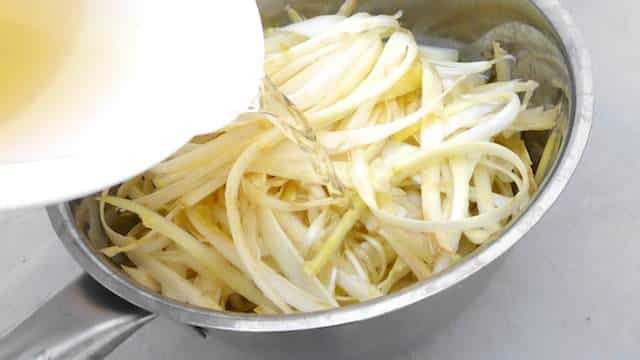 What remains is a perfecty trimmed and cleaned white asparagus, ready to use. You can either boil or steam these asparagus and serve them as a main with boiled eggs Flemish style, smoked salmon or with a classic hollandaise sauce. 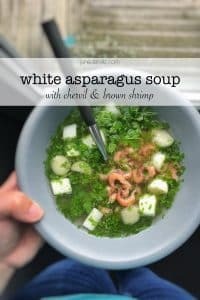 This soup recipe is the perfect starter for your asparagus main course.How great to turn stuff you would throw out anyway into an extra course! Just add chicken or vegetable stock, some garlic and fresh chervil. Plain and simple. The taste of this soup means to me that summer has arrived. White asparagus are at their best in June if you ask me. Depending on the warm weather the thickness and the flavor of the asparagus and the price can differ quite a bit. In my hometown here €7 to €9 ($9,5 to $12) per kilo is a bargain. 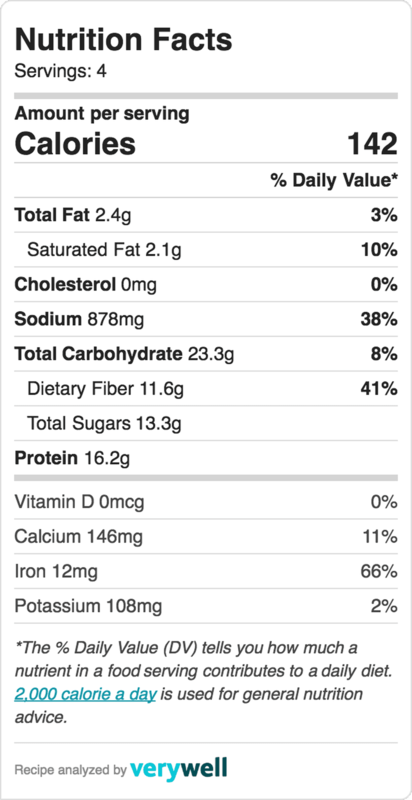 But I’ve seen them once at €17 ($23)… Bad weather, thin asparagus, dubious flavor possibly. Better buy them next time then. 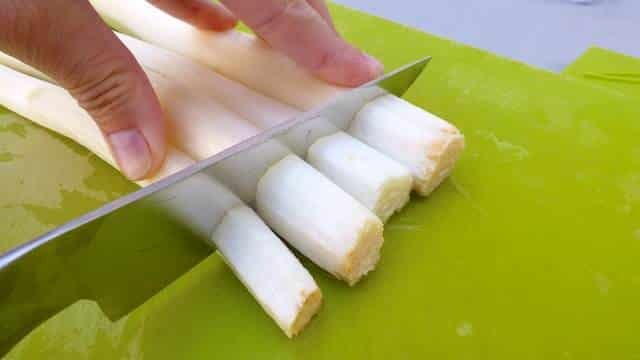 Carefully peel the white asparagus using a vegetable peeler. Add all the asparagus skins to a large and high pan together with the whole garlic cloves and add the vegetable stock. Season with a little pepper and salt. Bring all this to a rolling boil and then simmer the stock and the asparagus skins under a lid for 45 minutes. In the meantime chop off the bottom ends of the asparagus (about 1 inch or 2,5 cm). 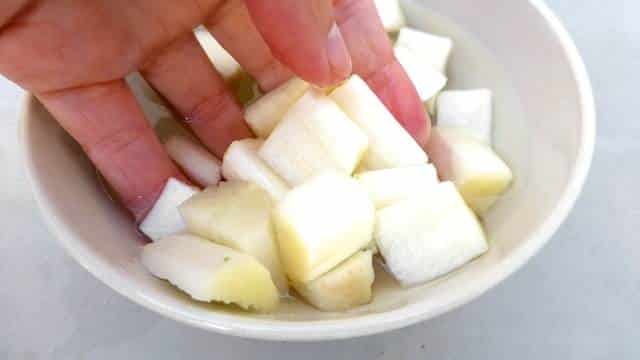 Chop these bits in smaller chunks and soak them in some cold water (or they will change color) until needed later on. Use the peeled asparagus for another recipe (boiled, poached or steamed). Once the asparagus skins have boiled enough, remove them with a slotted spoon together with the cooked garlic cloves and discard. Bring the stock to a light simmer again. Check the seasoning and add extra pepper and salt to taste if necessary. Add the soaked and drained asparagus chunks. 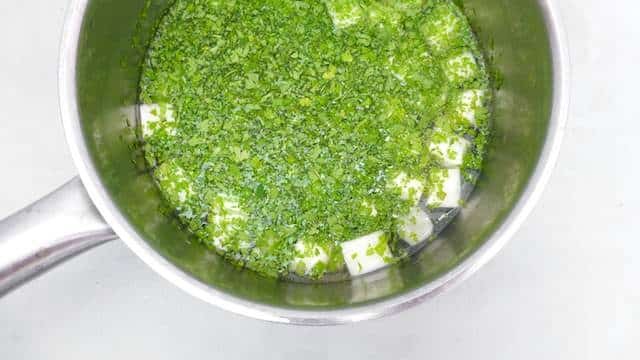 Chop the fresh chervil finely and add it to the soup as well. Stir well and simmer for another 2 minutes. The asparagus chunks must still be crunchy. Take the pan off the heat and scoop the soup into bowls. Sprinkle with some brown shrimp. Serve hot.